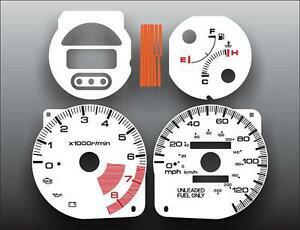 customgauges has no other items for sale. This item is for a white face vinyl plastic overlay set for the vehicle listed. Gauge overlays are adhesive backed and install over your stock faces, require no needle removal and won't void your warranty. Pictures illustrate what look is achieved after installation. Items that come in this kit. Sales tax may apply when shipping to: IA*, MN*, UT(6.85%), WA*. Paypal is the required form of payment for all our listings. Please contact us if you have any questions.